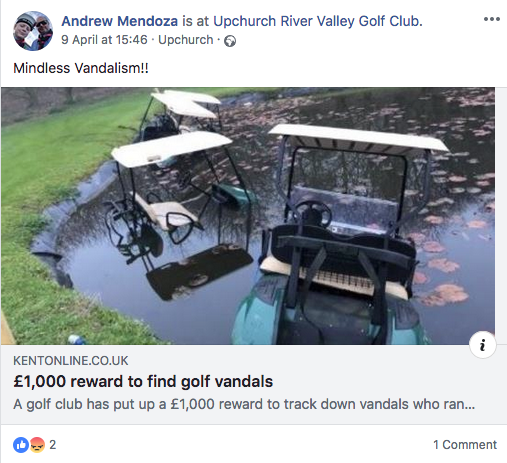 A Kent golf club is a offering £1,000 reward for any information that leads to a prosecution of vandals who caused extensive damage to its course. Kent Online reports that 10 electric golf buggies were damaged and at least four ended up being driven into a lake and ruined at Upchurch River Valley Golf Club in the early hours of Sunday, April 7. There were also tyre marks left in a bunker and young saplings were uprooted during the ‘night of mayhem’. A spokesman for the golf club said: “The owners are keen to find our visitors who damaged buggies and the course in the early hours of Sunday morning. The club, which has an 18-hole course and two nine-hole courses, was opened by builder David Barling on June 14, 1991, after he bought the former Natal Farm. A police spokesman said: “Officers are investigating reported criminal damage at a golf course in Upchurch, Sittingbourne. Witnesses or anyone with information should call the police appeal line on 01622 604100 giving the crime reference 46/65766/19. Or they can call Kent Crimestoppers anonymously on 0800 555 111. 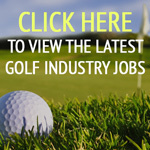 The club is also anxious for information and can be emailed on proshop@rivervalleygolf.co.uk. peter on What will Tiger Woods’ astonishing comeback mean for golf participation?